Ashton Applewhite is on a crusade against ageism (lack of gray hair notwithstanding). She joins the show to discuss the myths and roots of ageism and her talk series, This Chair Rocks. We also discuss her Yo Is This Ageist site, why she scoffs at the Life Extension crew, how her critique of ageism intertwines with her critique of capitalism, what it’s like to suffer from analexophobia, why we should all consider ourselves old people in training, and how she launched the Truly Tasteless Jokes empire. Give it a listen! And if you’re in NYC, you can go hear Ashton’s This Chair Rocks talk on October 27! Details here! Bonus: my yearbook picture from 1989! 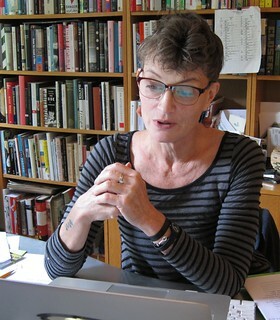 The voice of This Chair Rocks and Yo Is This Ageist, Ashton Applewhite is a Knight Fellow, a New York Times Fellow, and a Columbia Journalism School Age Boom Fellow. She is the author of Cutting Loose: Why Women Who End Their Marriages Do So Well , media liaison to the board of the Council on Contemporary Families, and a staff writer at the American Museum of Natural History. Credits: This episode’s music is Golden Years by David Bowie (it was either that or Never Get Old). The conversation was recorded at Ms. Applewhite’s home on a pair of Blue enCORE 200 microphones feeding into a Zoom H5 digital recorder. The intro and outro were recorded on a Blue Yeti USB Microphone . Processing was done in Audacity and Garage Band. Photo of Ms. Applewhite by me.